Is Spidey good this week? 50/50 chance! Many of you who listen to the P.O.W know that out of all the comics available to our fair readers I tend to gravitate more towards Marvel. I have always believed in voting for the things you believe in (product wise) with your hard earned cashesh! If you don’t like an artist or a writer team combo ..don’t buy the book! Many comic fans out there are what we call completionist, or people who have to collect all of something whether it is good or not. They just buy the damn book because they have to have a consecutive number in a line of books.They are ignoring the old adage quality over quantity. Now I am by no means ignorant to the fact that both Marvel,D.C., and Image are among some of the worse offenders for doing multi packaged cross overs and eight different foil embossed covers with Deadpool on them. They understand that for the most part the comic community is among these aforementioned completionists. It is their bread and butter. This small little rant brings me to the current Amazing Spiderman run. Amazing is currently putting our good friend Peter Parker through The Gauntlet. In turn it is also putting us good readers through our own personal Gauntlet too. I can not count the times before a Pick Of The Week that either Simon or Donna or yes even me, have said the phrase “I couldn’t really get through the book so I just flipped through it!”, I don’t blame them one little bit for saying it either. Lately Spidey has been well a little less than ‘Amazing’. In fact, I would say you might find yourself with more of a 25%/75% chance of it being good. Sadly Marvel will never understand that the story just isn’t that great because we aren’t all voting with our dollars. If every one started doing that you might find a change up in your books for the better. With the Gauntlet we have seen a revolving door of artist and writers and while that can be good for some books, but it just isn’t working for what should be one of the top tier books over at the House of Ideas. If you track the books that the gang usually reads and loves on a weekly basis, you will find that most (if not all) of the books have a creative team that are consistent and are staying with a book for long periods of time. This is what all of Marvels top big name books should be enjoying.Instead of the on again off again story/art of what we have been getting here. Why not put a great artist like Micheal Lark and writter like Dan Slot on the book and KEEP THEM on it for a year. Give them time to build up a long subtle story arch like you would get on a television series. Let them put their style on it! 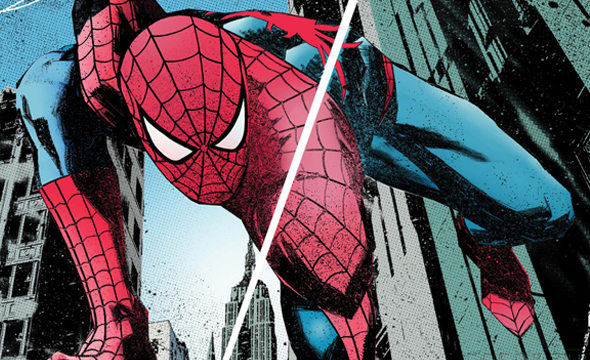 Look at the new issue coming out this week Amazing Spiderman # 626! The art by Michael Gaydos looks great, and we know Fred Van Lente can craft a great story so keep them on it! You will see that you will not only get a much more crafted story, but Spidey might actually start to have a certain style again. Right now Amazing Spiderman is just another subway add that sometimes is clever and sometimes I just kinda ignore it because it will be gone in the next few seconds anyway.